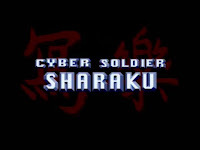 Cyber Soldier Sharaku is a Japanese game presumadely made about an anime. Set in the town of Edo in the year 7000, its a world populated by intelligent humanoid-animals where the tradional ways and advanced technology coexist. Sharaku, the player's character, appears to be a mercenary known as a Cyber Soldier working for some sort of organization trying to save the world. Your boss gives you a mission where you must go to Edo and to defeat Syzar and his henchmen: Junk and Nara. It's a point and click adventure and a very limited and linear one at that. There is no graphical user interface and during the game you have very few options of what to do. Basically if what you're doing doesn't advance you in the game than you would of already seen it. The game-style is similar to "Kingdom: The Far Reaches" except that instead of choosing your location on the map you make your way around by choosing direction. What you can interact with while exploring is basically limited to talking with NPCs but on a couple occasions you can interact with items. There are also boss battles where you have multiple attacks to choose from by clicking on a specific area of the bosses' body. Basically to beat a boss you must select the correct attack using the information you see on the computer at the very beginning. However if you select the wrong attack the player won't be killed so you can always win by trial and error if you don't know where to hit. Despite the games crippling limitations and that it's entirely in Japanese, the hour or so that it takes to complete is actually quite entertaining. 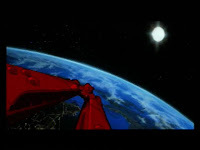 The unenventful talking parts are regularly interspersed by a cutscene such as an action sequence. So there is usually something interesting happening in the story, you never spend too long talking before you can advance or a cutscene occurs. At the beginning of the game, before you aquire your weapon (a pole), there is an action sequence where a couple guys try to start trouble in a restaraunt. One of them uppercuts a bystander and than throws a punch Sharaku, who grabs his fist and twists his arm around disabling the attacker. Not long after that there is a fairly long cutscene when you find your main ally - Naigan. She takes you a laboratory of some sort where she gives you high tech glasses capable of identifying the tyrant. The player automatically uses those glasses at the performances in the town in order to find Syzar. 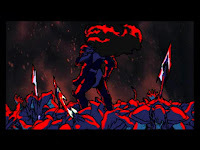 The boss battles are definitely the best parts of the game, the anime-style action sequences and the inclusion of blood make them quite entertaining. Also the multiple choices of attacks during the battles means they are the most interactive part of the game. During the first battle with Junk you must cripple his arm because he blocks your attacks with his claw. Once he can't use his arm than he can be easily hit in a vulnerable spot and defeated. The battle with Zara is the worst one, you only have 1 second to be able to move the cursor and click before being hit by a fireball. This can get quite annoying as it might take a long time before you are able to hit the right spot. A doppleganger of the boss will appear and you must decide which is the real one before attacking and killing her. By far the most spectacular battle is the one at the end with Syzar. The character fails with his first attacks to do any damage and the boss retaliates by smashing him through a wall. Then the battle takes to the roof of a tall pagoda where they fight in true anime style: flying into the air, throwing energy balls and surviving massive explosions. In conclusion the game is an interesting one that is definitely worthy of a playthrough. However it loses its entertainment value very quickly because it is so linear. Therefore you should treat it as a curiosity, if you play it expecting decent gameplay than you will be dissapointed. Because it's one of the few games developed in and exclusive to Japan that makes it one very interesting CD-i obscurity!